Click image to see larger map. The Asylum Run Interceptor was constructed in 1923 and carries an average of 2 million gallons of wastewater every day from Susquehanna Township and Penbrook Borough. Project Purpose: This project will rehabilitate 3,195 feet of the Asylum Run Interceptor from the Department of General Services Annex Complex across Cameron Street to the Paxton Creek Sewer Interceptor along the Paxton Creek. Project Summary: Both cured-in-place pipe and new PVC pipe will be installed in the project area. Above ground pipes will be placed along the ground in the project area to bypass flows. 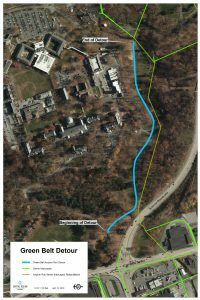 To protect public safety, the Capital Area Greenbelt will be closed in the project area throughout the duration of the project. Sycamore Drive, adjacent to the Greenbelt, will serve as a detour for the pathway during the project. • Early June – Late June: Crews will mobilize to the site and clear vegetation to prepare for excavation where necessary. • Mid-June – Late August: Crews will install bypass pumps and piping. Pipe lining and pipe replacement will begin. • September: The project will end with final restoration of the grass and pathway. Location: From the Department of General Services Annex Complex accross Cameron Street to the Paxton Creek Sewer Interceptor along the Paxton Creek near Maclay Street. Project Contractor: Joao & Bradley Construction Co., Inc. Questions: Please call Capital Region Water at 888-510- 0606 or email info@capitalregionwater.com if you have any questions. Special thanks to the Capital Area Greenbelt, Brightbill Industries, and R&M Variety for their assistance on this project.